We read poetry aloud. He is on the ground in front of me. I rest my elbows on my knees and lean over in my beach chair. After swimming, his black curls have slid down his neck, his hair now heavy and immobile to the wind. The ocean breeze carries a chill, so he puts on his t-shirt, covering the stone Andean cross around his neck. I read poems about trains, about the people and places that pass by in an instant, Indians and women in calico dresses, about something lost on a journey, or found. Then he reads “Mock Orange” and “Eros” by Louise Glück. He doesn’t know what they are about but knows he feels sorry for her. We trade books. Read on. I pull my shirt over my wet swimsuit in a vain attempt to shield myself from the wind. My damp towel is still wrapped around my legs as I close my eyes. As he strums his guitar, his bracelets brush against the wood. Soon he moves to the chair beside me. “I always wanted to do this,” he says. “You write a poem and I’ll write the music, then we will put them together.” He gives me a sheet of paper that he ripped from his journal. I use the journal as a surface, and he warns me not to look inside. as if I could see all the way to you. is as close as I can get. 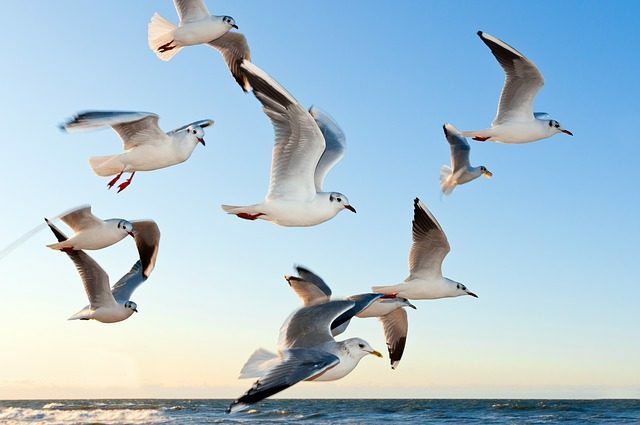 That day on the beach, seagulls dot the sand, surveying, their heads regally held parallel to the ground, their eyes sharp. They’re looking for subsistence. Any bit of pretzel or stray boardwalk fry that will keep them going on, keep them flying for another day. “I like birds,” he says. “’The idea of birds’ is like the name of a poem,” he says. His wide lips form a smile, pushing up the apples of his cheeks. We run back into the water. I can feel the tide pulling me out.